Craving fries, but don't want all the carbohydrates? Rutabaga is a much lower carb substitute than potato for some applications. French fries is one of them. The fries do not taste exactly like potato fries, but they are close, somewhat like sweet potato fries (which some people like anyway, although I was never a fan). These are baked in the oven. From what I have read, attempts to deep fry are generally not successful, although I am planning on some experiments to see if a hybrid bake / deep fry method can be used. Stay tuned! Preheat the oven, I used 375F on convection mode. My first attempts used a higher temperature for a shorter baking time, but I got much more uneven results, with burnt edges. Peel the Rutabaga, then slice into strips. You don't want to make giant steak fries, these are about 3/8 of an inch in width. Put into a small plastic container, add some oil (I used peanut oil), put on the lid, and shake to coat the fries with oil. 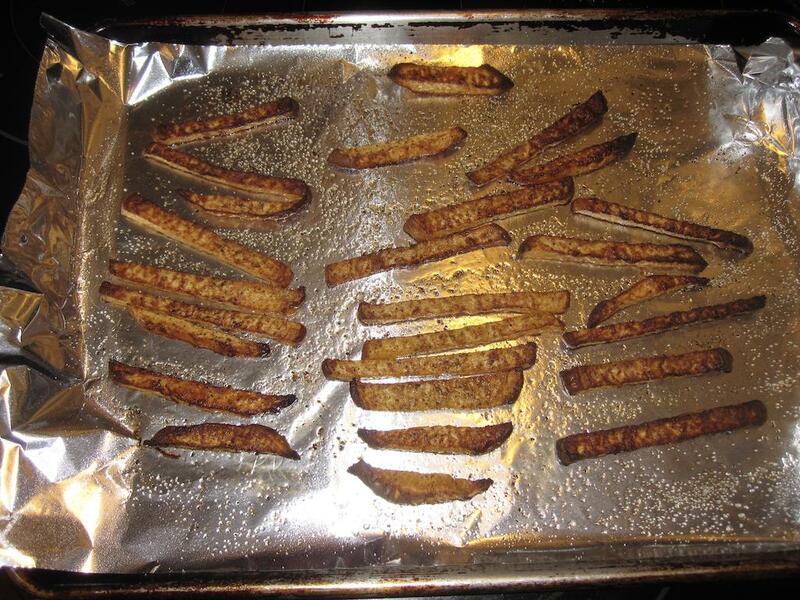 Arrange the fries on the baking sheet, and sprinkle with salt (and optionally pepper) and place in oven. After about 30 minutes, turn the fries, bake an additional 10-20 minutes. Actual baking times will likely vary considerably from oven to oven. Remove from the oven, take the fries off the pan, and eat as soon as they cool down enough, as they don't get better with time. They are a bit more soggy than regular fries. I find that dousing with malt vinegar really improves the flavor (which I used to do with regular fries anyway), and while still not exactly like "real" fries, they were very close, and of course much lower in carbs. I also tried them sprinkled with a Cajun spice mix to make a seasoned fry, and that worked pretty well also. I usually triple this, and keep it in a spice shaker; it shakes out better if you whir it in a spice grinder or a blender first. It goes well on roasted meats, fried fish, and into dishes such as hash and hashed browns. Put it on before cooking; for meats you might want to rub it in and let it sit for a half-hour or so before roasting. It also makes a good basic seasoning for sour cream dips and such.